Meet the Fairy Penguins at Weymouth Sea Life. Max is OBSESSED with penguins. From reading Lost and Found by Oliver Jeffers to death when he was younger, to sitting and researching them now. His uncle is currently in Australia, so once he found out they had their own native penguins, that was next on his list. Lucky for him (and me!) 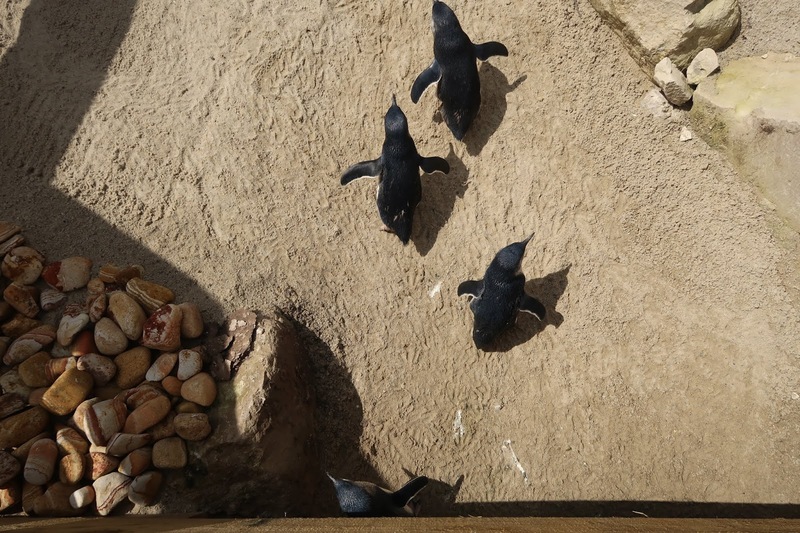 we didn't actually have to go very far to see them as one of our favourite places, Weymouth Sea Life Adventure Park had just taken the only colony of fairy penguins in Europe under their wing. We've been to Weymouth Sea Life quite a lot recently and had been curious about what they were building at the back of their park for some time. Whilst Max had grand ambitions of giant sharks or whales, I knew it would be something adorable. And we weren't wrong. A state of the art facility holding the world's smallest penguins from the other side of the globe. We couldn't wait to see what these adorable penguins looked like, so when an invite to visit them came to me, we raced down to see them! The state of the art enclosure is located at the back of the park near the otters and the ocean tunnel, with plenty of signs to help you find it, we raced over there first. It's worth noting that there is a show bath that you have to walk through before you enter the enclosure. This is to prevent the spread of harmful things such as bird poo and other problems that the penguins might face. Unfortunately, with flip flops on, it wasn't the best walk through! I'm going to remember to wear trainers next time. Fairy penguins (also known as little blue penguins) are the smallest in the world, reaching a height of 25cm's and only weighing around 1kg. They are used to the climate in Australia, so this warm weather we have been having has been great for them! They came from a sea life sanctuary in Australia and made their way across the continents to find a new home in Weymouth due to their normal climate being similar to ours. With 20 penguins in total, there are plenty for you to see playing around and we found that they loved to hide under the bridges and chase each other around their play enclosure. It was honestly one of the cutest sights we had seen! It's worth noting that when we were there, the penguins were hiding. I don't know if it was because our first time around, their home was being cleaned or they were hiding from the sun. We decided to head to the play area for a while and then dropped back an hour later to see if the penguins had emerged and luckily they had! I was blown away by how small they actually were, but also how loud they seemed to bleat. Each of the penguins has a colour coded band to allow you to see what their name was and some more details about them. We loved spending ages trying to find each of them and work out who was the loudest/cutest/funniest. We could have happily spent hours in there watching the cheeky penguins running around. It's amazing to think that these gorgeous fairy penguins have flown all the way from Australia to spend their lives with us. Weymouth Sea Life are hoping in the future to breed these fantastic creatures to create a sustainable colony of them in Europe. But for now, we are going to be heading back as much as possible for Max to fall in love with them over and over again! Fairy penguins, you have our heart. Thank you Weymouth Sea Life for introducing us to these perfect penguins. We had an absolutely fab day exploring the park and all the creatures, but these are definitely our favourites.